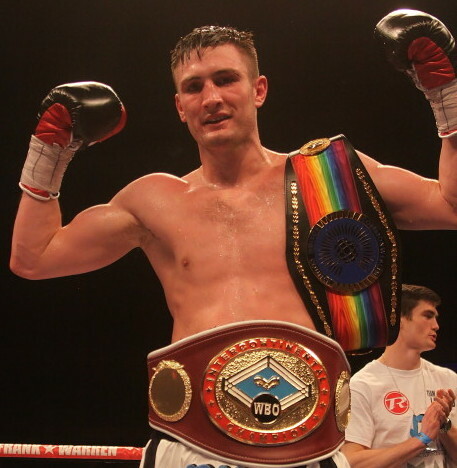 Birmingham middleweight star Tommy Langford overcame a tough challenge Dronfield’s determined Lewis Taylor to defend his WBO Intercontinental title and also claim the Vacant Middleweight Championship at the Liverpool Echo Arena. It was a gallant effort from both fighters who put on a real barn burner of a domestic scrap. All-action Langford came away with a unanimous decision in what was his 16th professional career win. Both fighters defences looked questionable in an even and lively opener. Langford slightly edged the first round by using his left jab well and making the middle of the ring his own. 26 year-old Langford stepped up the pace in the third round and began to find his way past Taylor’s defence. The ‘Baggies’ mad bruiser began to show his class by landing some powerful shots on the gutsy challenger. Taylor refused to take a step back despite taking several big shots to the body. The Birmingham man sensed a stoppage in the ninth round and went after Taylor with a series of punishing combinations. By now, the contest had developed into a real scrap with both men landing shots at will. Taylor made an impressive reply by steaming into Langford at the beginning of round 11 but Langford took his shots well and came back with some lethal hooks of his own. Devon-born Langford retained his Intercontinental title and took home the Commonwealth belt with a well-earned unanimous decision from the judges.